In 1921, a League of Nations Commission on the private manufacture of arms concluded that before the First World War arms firms fermented war scares in order to sell more arms. In addition, arms firms organised international armament rings to keep prices high by playing countries off against each other. So, were the arms companies competing or cooperating with each other, and what did this mean for the war? The quarter century before the First World War was ‘a classical period of expansion for the private armament industry’.3 The 1889 Naval Defence Act ‘sparked an immense bout of warlike expenditure on the part of the continental powers.’ This sequence of events highlights the ‘unusual market-expanding effect by which production in the armament sector merely calls forth more production,’ embodied in the German Navy Acts of 1898 and 1900.4 The armaments race from 1910 onwards also increased profits for private arms firms. In the summer of 1914, the interest paid on armament shares grew, and with the coming of war, a number of prominent bankers, and many people associated with the government, increased their holdings. Sir Basil Zaharoff, who sold arms for Vickers, was one of the wealthiest men in Europe after the war5. Vickers was very profitable. Its total capital issued increased between 1886 and 1914 from £750,000 to just over £7 million. In 1913, Armstrong – Whitworth employed 26,561 workers. By 1915 this had risen to 47,583, and 78,000 in 1918. By 1914, Vickers and Armstrong were working together to win contracts in the naval trade, with Vickers securing the lion’s share. Vickers and Armstrong also collaborated when it came to foreign markets, and their combined selling power helped them win contracts. Between 1900 and 1914, Vickers and Armstrong won £34.87 million in sales and 63% of total business in combined markets of South America, East Asia, Turkey, and Greece.6 In 1912, Chile bought two dreadnoughts and six destroyers from Armstrong, Vickers, and Coventry Ordnance Works at a cost of £7 million.7 Vickers and Armstrong won the Chilean warship contract by working together. Armstrong formally took the order, and under the terms of the agreement, Vickers enjoyed a share of the returns and the work. Combined, Vickers and Armstrong had a 63 percent share of the market in ships and ordnances, worth £40 million.8 In February 1913, Vickers propositioned Armstrong into an agreement of an ‘equal share of business in all parts of the world’, which Armstrong agreed to.9 The arrangement between Vickers and Armstrong was very secretive in nature, and although Vickers wanted Armstrong’s contacts, they did not always want their active participation10. The War Office gave most of their contracts to the state owned Royal Ordnance Factories rather than the private firms, although the Admiralty both spent more on equipment and placed a greater number of orders with private industries. Between 1909 and 1914, four fifths of artillery pieces for the army, and their ammunition came from the Royal Ordnance Factories. However, the 18 and 13 pounder quick-firing guns were a composite design using parts produced by Armstrong, Vickers, and the Royal Ordnance Factories. 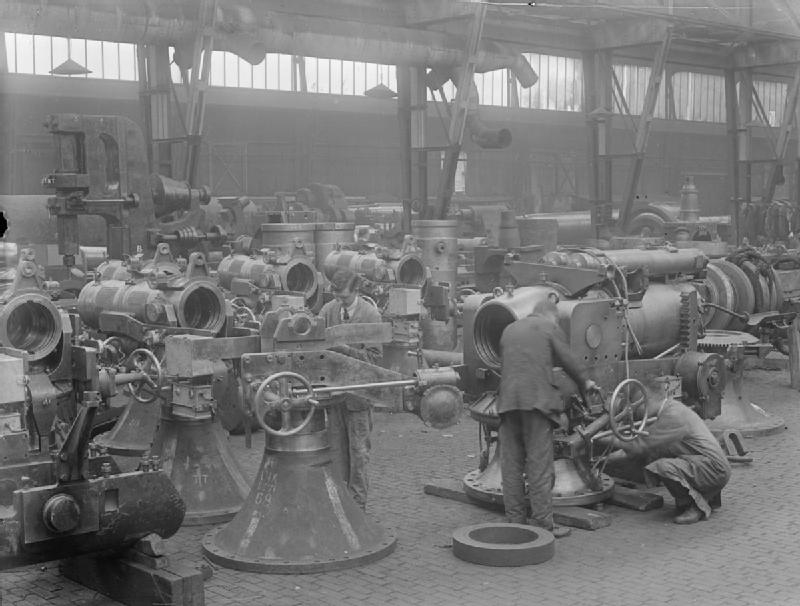 Vickers and Armstrong both pleaded that they and the Woolwich Arsenal should monopolise production in order to recover development costs, but the War Office insisted that the Coventry Ordnance Works would take a share of the orders.2 Woolwich could not provide enough breech-loading guns, and therefore the Admiralty drew in new armour-plate and ordnance manufacturers. Despite the close co-operation between Vickers and Armstrong the younger firm began to dominate. Their marine hardware was preferred by Brazil, Turkey, Spain, Russia, China, and Japan, who together made up the world’s major importers of arms.1 Coventry Ordnance Works were not considered as serious competition prior to 1914, while Armstrong’s recent record of product innovation had been poor, they offered virtually no new weapons to compete with Vickers.2 In the 1920s during the post-war slump for the armaments industry, a weakened Armstrong would be rescued through a merger with Vickers, financed by the government. « Shells, Shells And More Shells!